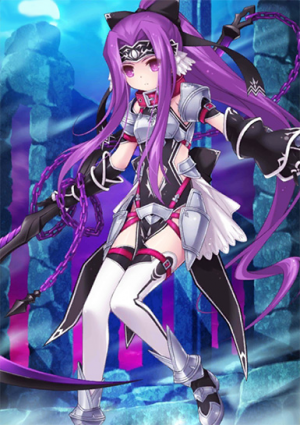 This Article is for the 4★ Medusa , for the 3★ Adult version see Medusa, for the 4★ version see Gorgon. Increase Quick Card performance by 10% and Increase Party's NP gain by 15% while she's on the field. The youngest of the three Gorgon sisters in Greek mythology. A goddess, born as the manifestation of men's desires. A perfect "idol." 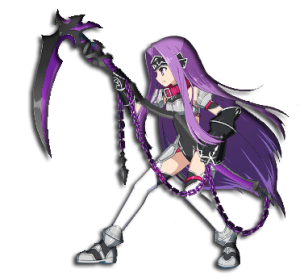 For reasons unknown, the anti-hero Medusa was summoned as a Servant in a form close to that of her two sisters, Euryale and Stheno. Her weight is self-reported as "the same as my sister's weight." 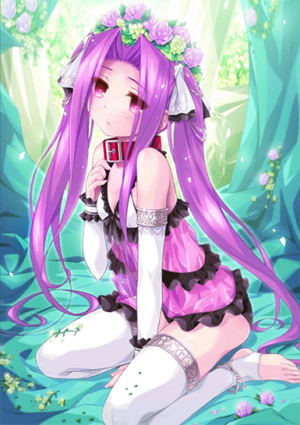 She is a pretty young girl who closely resembles her two sisters, and her personality is different than when summoned as a Rider. Unlike her sisters, eternal children who cannot survive without another's help she already help, she already has the power to fight. The seeds of an evil that could take innumerable lives sleep within her. 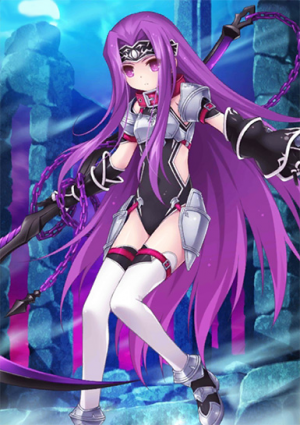 The ability that the original Medusa (Rider) has as a skill. 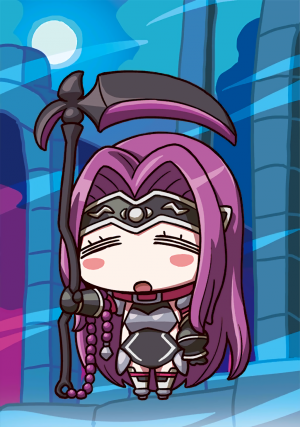 In other words, the ability that the current Medusa will possibly gain in the future is manifested as a Noble Phantasm. After a strike with her immortal-killing blade, she gazes upon her opponent, instantly petrifying them. This "Cybele" is on the most powerful level of Mystic Eyes. Her powerful attacks are centered around this technique. An inherent skill that is the same as her sister's ability. It has a magical charm effect on men, but can be avoided with a Magic Resistance skill. Even without Magic Resistance, the will to resist it can also lessen its effects. Temporarily enhances strength. A special type of attack possessed only by monsters and magical beasts. By using it, Strength increases by one rank. 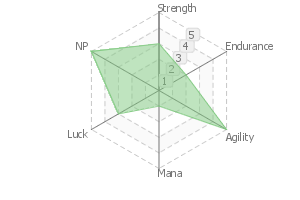 The duration of its effect depends on the skill's rank. 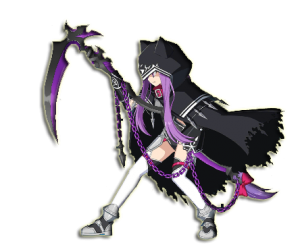 ...Since her monstrous side is quite weak, it has a low rank. Her memories of those wonderful days will keep her fighting until the end. Clear Seventh Singularity and reach Bond Level 5. As a Divine Spirit, she would normally be unsummonable, but faced with the threat of the end of human history, she manifested as a Servant. Now that she's been summoned here to Chaldea, there must be at least two people she'd like to meet. At first she won't be able to do much but look on from a distance and cry, but let's give her time. A goddess born as a perfected "image (idol)", the embodiment of men's longing. 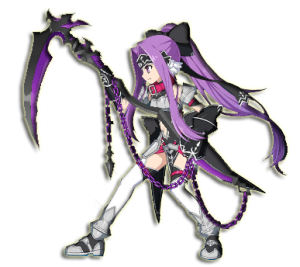 Due some factor, the anti-hero Medusa acquired a condition as a goddess that is close to that of her two sisters and manifested as a Servant. Her appearance is that of a lovely girl similar to her sisters, and the personality has also changed from when she is a Rider. However, unlike her sisters who are “eternal young girls that cannot live on unless they borrow the help from another”, she is already endowed to some extent with the power to fight, the demonic buds that can take many lives. 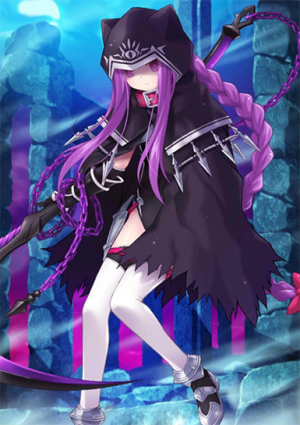 The abilities that up until now Medusa (Rider) had possessed as skills - in other words, that which the current Medusa should acquire in the “future” - attained as a Noble Phantasm. After haunting with the immortal-slayer blade on her hands, she instantly turns the opponents within her line of sight into stone - an effect by means of mystic eyes of the highest level, “Cybele”. She performs a fierce attack with this at its focal point. The same personal skill that her sisters possess. It works as a fascination magecraft-like effect towards males, but evasion is possible by means of the skill Magic Resistance. Even without Magic Resistance, one should be able to abate it so long he maintains a will to resist. The ability to temporarily amplify STR. An offensive special quality that only monsters, magical beasts have. It is possible to temporarily raise STR in 1 Rank by an amount of time that depends on the rank in this Skill. ...rank is low because her demoniac disposition is small. The feelings towards those beloved days support her struggle to the very end. A divine spirit-type of Servant that originally would never be summoned. Since she was summoned at Chaldea, there is probably at least two individuals she wants to meet. At first she will be unable to easily get close to them, and will probably only be manage to stare at them at a distance while shedding tears, but lets just watch over without rushing things. This page was last modified on 17 February 2019, at 11:47.